What is a Machiavellian librarian? A final definition of a Machiavellian librarian? Creating and becoming library champions—we’re number 1! Visualization: libraries need to get on the wagon! Machiavellian ideology in the library: oh my! The road less traveled: how the hell did I became a librarian? Do librarians ‘rock the boat’? Do they challenge those around them to win influence and advantage? Why is it that librarians are little found on the ‘influence’ grid of personality assessment tests? 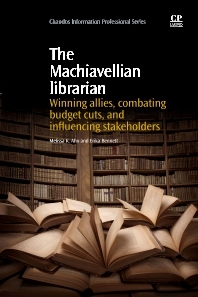 The Machiavellian Librarian offers real life examples of librarians who use their knowledge and skill to project influence, and turn the tide in their, and their library’s, favor. Authors offer first hand and clear examples to help librarians learn to use their influence effectively, for the betterment of their library and their career. Opening chapters cover visualizing data, as well as networking and strategic alignment. Following chapters discuss influence without authority-making fierce allies, communicating results in accessible language and user-centered planning. Closing chapters address using accreditation and regulation reporting to better position the library, as well as political positioning and outcome assessment. Melissa K. Aho works at the Bio-Medical Library at the University of Minnesota, and is pursuing a PhD in International Development at the University of Southern Mississippi, USA. Erika Bennett is Instruction Services Team Supervisor at Capella University. She has written book chapters, conference papers, and articles on information literacy and assessment. Erika holds an MLIS and an MS in Educational Psychology.